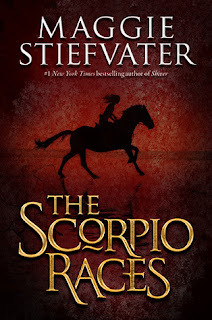 When I heard about The Scorpio Races, it was just after I had finished Forever (which is the last book in Maggie's Wolves of Mercy Falls trilogy) and I was immediately extremely eager to read it. But for some reason I thought it was some sort of dystopian, which it wasn't at all. It was a beautifully written and constructed fantasy about killer water horses. When I first read the killer water horse part, I immediately thought "Oh, it's a kelpie!" And, technically, it is, only in the book it goes by the Irish name of capaill uisce. (Don't even ask me how that hell to pronounce that, because I haven't the foggiest.) So if you're a fan of the kelpie lore, then you'll definitely enjoy this one. Maggie's writing is, as always, poetic and just lovely. She wrote with a very realistic Irish cadence, which added to the overall atmosphere of the novel and the realism of the characters. Maggie's writing style is no doubt one of my all-time favorites. My biggest problem with this book is that the entire thing is pretty misleading. Take the cover, for example. It's Puck galloping away on a horse. 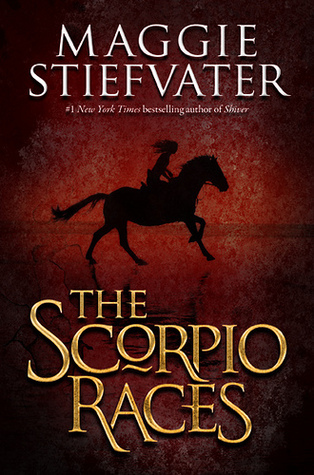 The book is called The Scorpio Races, and the description makes it sound pretty intense and action-y. Put that all together, and my impression was that, unlike Maggie's Shiver series, The Scorpio Races would be more of an adventure. But it wasn't. Of course, Maggie writes beautifully, but the novel wasn't really about the scorpio races at all. It was about Puck coming into her own as a woman, and Sean and her slowly growing to love each other. It almost seems like the race is an afterthought, because it happens at the very end, and it's a very brief scene. There were quite a few superfluous scenes that I'm not sure what purpose they served for the story, and I honestly think the book could've done without them. Puck aggravated me at times--she had quite a temper about her, and would snap at people that were only trying to help her. That put me off of her in the beginning. But she was up against a lot, and she held her ground when any other girl would have given up, and that's what I admired most about her. Sean was the silent, brooding type, and his life was the water horses. He was the man on the island to see about the horses. He's won the races 4 years in a row, and if he can win this next one, he might have a chance at getting the one thing he really wants: a water horse named Corr that he's grown to love over 6 years of training it. He and Puck had a sweet relationship. It built slowly, and at times I wasn't actually sure if anything would happen between them. But I really liked Sean, even though I feel that his intense introversion made him not only distant from the other characters, but also from me as a reader at times. Overall, I really enjoyed The Scorpio Races. If you're a fan of Maggie's, then most definitely pick it up. 4 out of 5 stars. The book isn't perfect. There's a very annoying secondary female character who keeps popping up for no good reason, and I kept wondering why there weren't either policemen or lynch mobs on the island. These were small annoyances, though. I loved this book.